The ability to hide your Facebook profile from someone who searches you by name just changed to "it's complicated." The social networking company announced today that its seldom used "Who can look up my timeline by name?" feature will be gone in the coming weeks. "The search setting was removed last year for people who weren't using it," reminded Michael Richter, Facebook's chief privacy officer, in a blog post today. "For the small percentage of people still using the setting, they will see reminders about it being removed in the coming weeks." Facebook noted that its "Who can look up my timeline by name?" privacy feature could create a false sense of security. It didn't stop anyone from reaching your profile when your name popped up in a story or on a mutual friend's timeline. It also spurred plenty of puzzled "I can't find you on Facebook" remarks when two people were legitimately attempting to become friends on the social network. "The setting made Facebook's search feature feel broken at times," said Richter. "People told us that they found it confusing." This false sense of security is being replaced by controls on individual posts that you share, which Facebook calls "the best way to control what people can find about you." In an effort to better inform its one billion users of this, Facebook plans to remind everyone that public posts can be seen by everyone, including people they may not know. This warning message will be supplemented with a notice of how to change the audience settings for each post. 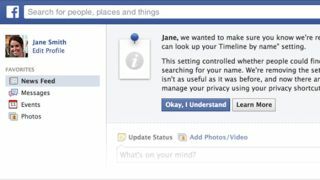 It also suggests visiting the privacy settings page within your Facebook account to quickly limit what you've shared in the past. There's certainly more control over individual posts, but complete anonymity on Facebook is going out as a more populated Graph Search comes in. Read: Facebook takes on Twitter in battle for TV social supremacy.